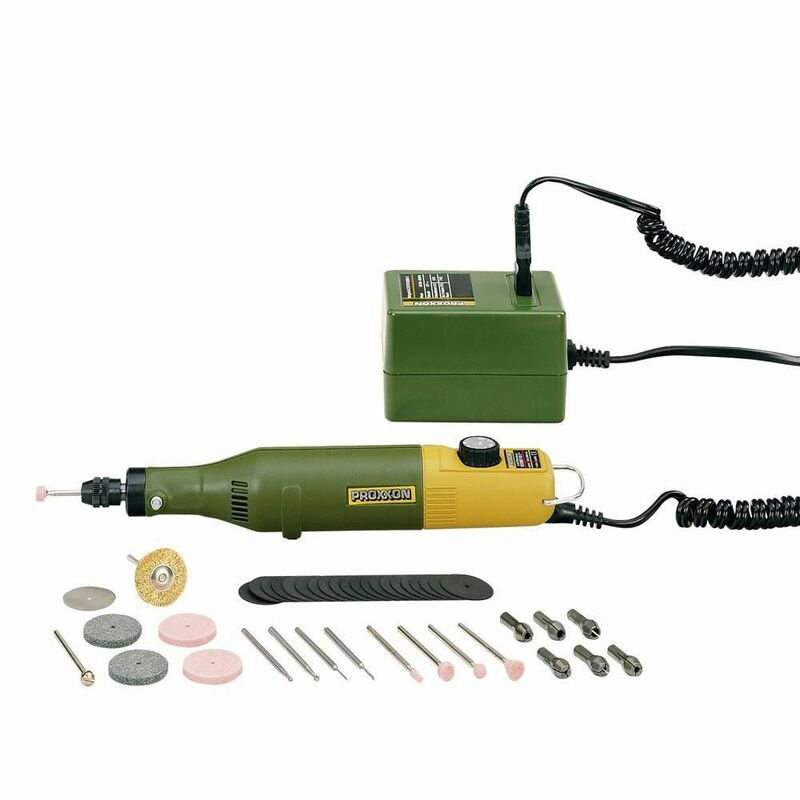 The Proxxon Model Building and Engraving Set is the right choice for creative hobbyists and model makers. The MICROMOT Rotary Tool 50/E in this set comes with six high precision triple slit steel collets in sizes 1.0, 1.5, 2, 2.4, 3.0 and 3.2 mm which ensure accurate clamping of the bits for highest concentricity and the precision you need for finest work pieces. Service Minder carbon brushes offer greater durability and 2X motor life. Strong 4.8 amp motor for market-leading power. Easy on/easy off paddle switch enhances product life and offers increased productivity. Extended spindle makes the Bosch DG300LPD the most versatile die grinder with the greatest power. Directed air flow diverts dust from components to extend life. The DeWalt DWE4557 features a high power 4.7 hp (maximum motor hp) 8,500 RPM motor provides overload protection which provides higher operating speeds under load. DeWalt's Dust Ejection System protects the motor from damaging particles entering air intake that would otherwise abrade the motor and increases brush life. Backed by a DeWalt 3 Year Limited Warranty for added peace of mind. Model Building and Engraving Set with 6 Steel Collets The Proxxon Model Building and Engraving Set is the right choice for creative hobbyists and model makers. The MICROMOT Rotary Tool 50/E in this set comes with six high precision triple slit steel collets in sizes 1.0, 1.5, 2, 2.4, 3.0 and 3.2 mm which ensure accurate clamping of the bits for highest concentricity and the precision you need for finest work pieces. Model Building and Engraving Set with 6 Steel Collets is rated 4.0 out of 5 by 2. Rated 4 out of 5 by Calgarybert from Good product It is a good product, exactly what I needed for the work I do. Rated 4 out of 5 by NewHampshireHomeowner from Well made, will last forever, versatile, quiet, just a tad too big Used for making models. I used a Weecher for years. It was light as a pencil but kept breaking. I'd disassemble it, rewire or solder, bypass the switch, etc. Finally died. This is the best replacement I could find. I've used it for about 10 hours. It's solid and dependable, very well made, professional quality, and sealed so it won't fill with clogging dust. The transformer is like a brick, but that's good because it stays put, doesn't skid around. The curly cord is plenty long and no trouble. The drill is well-balanced, weighs about as much as a small crescent wrench, with the weight in the middle, but a tad heavy. It's long, too. Compare to that 5" action figure. You can't "cramp up" on the nose because of the tail weight, but maybe just as well. I kind of lay it across my (big) hand and work lightly. Not sure a woman could use it for long or accurately. The hand chuck is a marvel, fast and simple, and holds any Dremel bit. It's quiet. Pricey at $95, but it'll probably outlive me. You turn it on by spinning the drill. The minimum speed is wicked fast, so fine. Dial is safer because you're unlikely to bump it on while changing chucks. Comes with some bits (subset of what's in the pic) and many chucks, and a cool green case you'll probably never use. Weechers are too flimsy and a Dremel is too big and unwieldy for models, so Proxxon looks like the only way to go. proxxon said that it does.